U S Vault Light Con. Co. 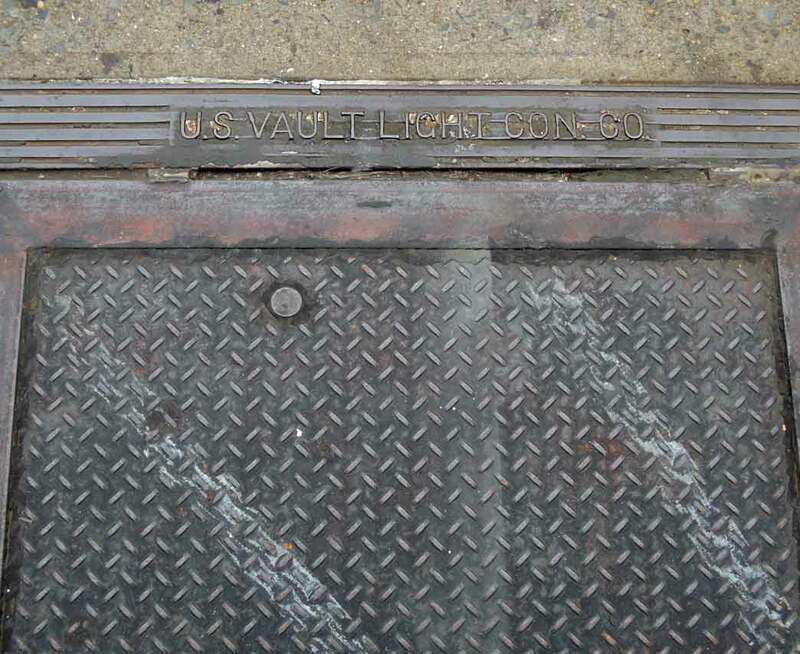 The U. S. Vault Light Co. dates from 1908, when they were listed at 8 Bronx Arcade in the New York telephone directory. The Gleason Realty Co. rented small stores in the Bronx Arcade, located between 138th St. and 139th St., in 1899. Norton's Up-To-Date New York Guide to Streets, Amusements, Trolley Lines, Railroads, Etc., 1903, locates the Bronx Arcade as running from 657 E. 138th St. to 142nd St. This is near Cypress Ave. in the Port Morris section of the South Bronx. There seems to be no survival of the "arcade" currently (2017). In 1912 Trow's New York City Directory listed U. S. Vault Light Construction Co. at both 8 Bronx Arcade and 509 Willis Ave., then a year later at 608 E. 137th St. This company consisted of the two partners, Peter Seringer (1877-1916) and Stephen Ufheil (1864-1940). Peter Seringer died, age 34, 4 January 1916 in the Bronx. Polk's Co-Partnership Directory for New York City, 1918-19, listed Stephen Ufheil and his wife, Emily Ufheil, as officers at U. S. Vault Light Co., now located at 830 E. 147th St., the Bronx. Stephen Ufheil was a witness at a court proceeding involving the Schillinger Fire Proof Cement and Asphalt Company in 1894 when he testified as follows, "I live over on Long Island, Dutchkills. I am a cement and asphalt layer. I have been such about eight years. I served my time at that trade. I make my living since the time. I learned the business by my brother, Joseph Ufheil; the one that was a witness here. I am employed as a cement and asphalt layer on the Cohnfeld Building, corner of Bleecker and Mercer streets. I worked there about two months. I done the asphalt work on the roof. I was under the control of Mr. Stern doing floors, and I did the basement of the cellar floor. I did only the finishing work. The floors got finished in first-class order; were trowelled off. They were trowelled off smooth as could be. ..."
Stephen Ufheil appears in the 1900 U. S. Census, as a cement mason, age 36, born December, 1864, Germany, living with his family at 421 W. 22nd St., Manhattan. His brother was listed as Joseph Ufheil & Co., 25 Fanueil, Boston, in the Directory of American Cement Industries and Handbook, 1901, under the category "Contractors and Large Users of Cement." Stephen Ufheil is buried in Old Saint Raymonds Cemetery, Bronx. His gravestone reads, "In Memory of Rose Ufheil 1870-1909 / Stephen Baum 1911-1911 / Stephen Ufheil 1864-1940." In 1909, regarding the new IRT subway station at Bowling Green, Manhattan, the following appeared in Engineering Record, Building Record and Sanitary Engineer, Vol. 59, No. 11, 13 March 1909, "The prism lens vault lights were set in a concrete floor supported by these walls at the level of the old Battery Park pavement, and furnish noticeably good light for the new platform. They were very expeditiously set in January, when it is unusual to do work of this character, by the United States Vault Light Company, of New York." The Ufheils either sold out or otherwise lost control of U. S. Vault Light soon after 1918-19. Polk's 1920-21 directory listed U. S. Vault Light & Bronx Iron Works Co. at 830 E. 147th St., consisting of Morris Frazer (1881-1943) and Michael Dragone (1890-1965). Michel Dragone was born 25 March 1890 in Matera, Italy, and immigrated to the U. S. ca. 1910. In 1921 Morris Frazer and Michael Dragone were partners in a new incorporation called the Port Morris Iron Works. This business, also known as Frazer & Dragone was located at 830 E. 147th St. Then in 1924 Frazer & Dragone became Diamond & Frazer Iron Works Inc., still located 830 E. 147th St. Frazer's new partner was Philip Diamond (1880-1962). According to his naturalization declaration of intention, Philip Diamond, iron worker, was born 15 May 1880 in Kiev, Russia (later Ukraine), and emigrated from Southampton, England, on the vessel New York, arriving in New York 20 July 1904. Frazer, too, was an immigrant from Russia. He registered for the World War II draft in 1942 when he said that he was born 20 Oct. 1881, Vilna, Russia (later Lithuania). He and Diamond were close neighbors in the Bronx, appearing back-to-back on census reports in 1925 and 1930. Diamond & Frazer was in the New York telephone directory through 1928. Glassian.org estimates the U. S. Vault Light Co. was in business approximately 1912 to 1918.